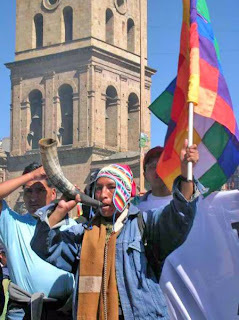 Bolivians today we begin to walk down a new path towards the consolidation of the democratic and cultural revolution. When we arrived in government in 2005, history made us face the challenge of pushing forward a process of change to refound the country. We had to undertake important tasks: the nationalization of our hydrocarbons, the Constituent Assembly, autonomy as part of the new constitution, the end of illiteracy, the redistribution of land, an end to discrimination, the redistribution of wealth with the Bono Juancito Pinto, la Renta Dignidad and the Bono Juana Azurduy. These important tasks have been fulfilled, that is why now we have to propose new measures to give a vital boost to the country. We have developed the Government Program "Bolivia Advances" which incorporates the suggestions and proposals made by social movements, workers, the professional colleges and the organised middle class, all pointing to a common goal: to advance in the process of change to develop Bolivia and so that those who inhabit this land full of history and culture live well. In the next five years, Autonomous Bolivia will take a Great Industrial Leap and we will leave behind being an exporter country of raw materials, the Great Highway Revolution will definitively integrate and unite our regions, the Tupac Katari satellite will allow us to communicate to all ten million Bolivians; we will be a productive nation, the peasants will have Universal Agricultural Insurance; education, security and social justice will reach each communities and families across the country. To consolidate this set of plans and programs and projects, the country needs the combined efforts of all. So I invite the citizens to be part of this historical process and today we can build our dreams and the dreams of our children. We are convinced that all measures we propose in our Government Program "Bolivia Advances" are viable and possible to achieve, we just have to undertake them together because ultimately, change has no party, the change is in the heart of all Bolivians who wants to see a Grand, United and Solidarity-based Homeland. One of the accomplishments not mentioned is the lessening of violence since Evo kicked out the DEA and the US ambassador (to Bolivia) for fomenting divisiveness and violence throughout Bolivia. To peacefully and non-violently stop that obvious and naked aggression by the world's largest super-power is in my opinion, one of Evo's greatest accomplishments, allowing him to enact much needed reforms and other initiatives--for all Bolivians, and not just for the elite. Also not mentioned are the efforts Evo and Bolivia have made to unify and strengthen the alliances between LatAm nations, in an ongoing effort to escape the clutches of US imperialism. Much has been done, but more work obviously still remains. Viva Bolivia and Evo Morales!